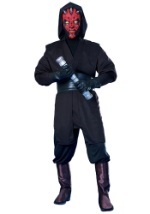 Battle the Republic or Rebel Alliance as a Lord Sith in this adult robe! The polyester robe features a large hood and over-sized flowing sleeves. It measures 59" long for the standard size and 60" long for the x-large size. The finishing touch to our Darth Maul or Darth Vader costumes!